As you may have noticed by perusing my blog here, I tend to spend a good amount of time talking about what the Bible says… or rather what good interpretive practices (imho) allow us to draw from the biblical text. I should probably spend a bit more time than I do drawing from other texts as well, including sacred scriptures from other religious traditions. And now that I’m done with grad school, perhaps I will have the extra reading bandwidth to do so. A friend recently asked why I give so much primacy to the Bible. After all, with all the great religious and philosophical texts out there, what reason is there for preferring what “the Bible says” over and against what some other book says? So I’ll talk a little bit about that here, and you feel free to give your own thoughts in the comments. The simple, short answer is that I talk a lot about the Bible because I come from an evangelical Christian background, I am still a Christian, I’m friends with a lot of Christians, and most of my readers are Christian in one sense or another. And since most all Christians hold the Bible with some esteem, it makes sense for me to comment on what sort of wisdom and insight I think we can (or can’t) draw from the Bible. But, if you want to get into it more, I suppose I should talk a bit about what exactly I think the Bible is. One of the big questions when it comes to the Bible came to me from a philosophy professor friend of mine: Is the Bible the Word of God? To which, I confess, I would answer no. I don’t think the Bible is the Word of God. I don’t think the Bible itself ever claims to be the Word of God. I think we run into all sorts of bad theology when we maintain that the Bible is the Word of God. Why? Because it seems to me that the Bible as the Word of God very quickly leads to bibliolatry. Bibliolatry (from Gk. βιβλίον biblion, “book,” and -λατρία –latria, “worship”) is when you treat a book (in this case the Bible) as though it were itself divine. This is actually the perspective that most Muslims have traditionally held regarding the Quran. And, despite how many evangelicals today think and talk, is actually not the traditionally held Christian view on the Bible. I blame the Protestant Reformation. You see, for the majority of church history, the Bible was treated with reverence as one of the authoritative sources for Christian theology and life alongside apostolic (papal) authority and church tradition. Then along came the Reformation and the five solae, which were five of the big bullet points that Protestants tout as sources of authority in life and theology. One of these is Sola Scriptura (Scripture alone), which places the Bible as the sole and primary source of Christian theology. To be completely honest, I struggle with this one. It isn’t that I don’t find the Bible authoritative or important, but that I think Sola Scriptura tends to make the Bible into something that it simply isn’t, namely a self-interpreting document. I hear this all the time, people saying something like, “Well, I just go with whatever the Bible says,” which is absolutely ridiculous! I mean, have you read the Bible? First of all, there are things in there that I really don’t think we should “just go with.” Things like holy wars and divinely-sanctioned genocide. These should strike us as odd, even problematic, especially if we as Christians think that the loving character of Jesus matters. Second, this attitude sort of assumes that what the Bible says is fairly straightforward, which (again), if you’ve ever read the thing, you would know it very much is not. There are numerous interpretations of virtually any passage or teaching in the Bible. And not crazy, heretical, I’m-just-making-stuff-up interpretations; but legitimate, well researched, I-got-to-this-conclusion-by-doing-my-homework interpretations. In other words, nobody reads the Bible objectively. We all have biases, we all have presuppositions, and if the postmodern turn has taught us anything, it is that objectivity is an unobtainable (albeit useful) goal. If you’ve ever taken a Bible or theology class, or if you’ve got one of those pastors whose sermons go deeper than just seven steps to feel good about your middle-class American affluence, then you’ve probably heard about a little thing called the Wesleyan Quadrilateral. 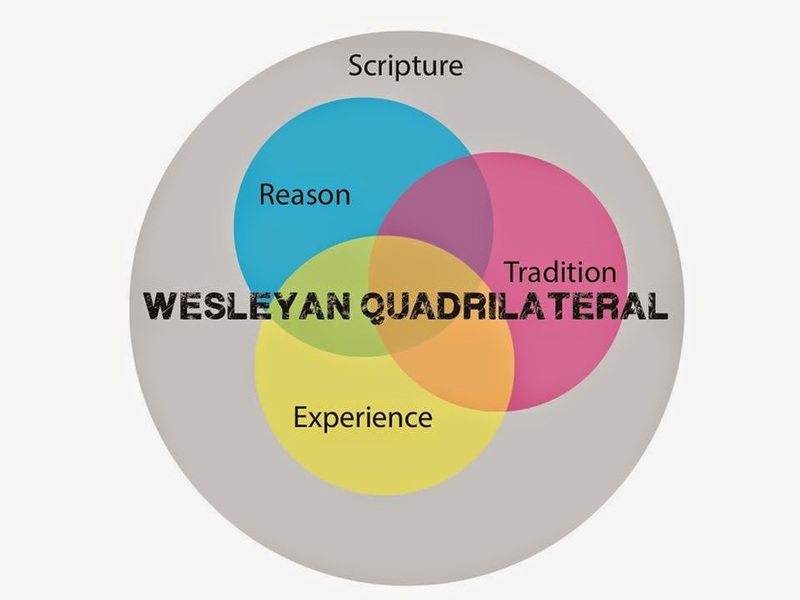 The Wesleyan Quadrilateral (or WQ, as they say in the hood) essentially says that God and Christian theology is best understood by consulting four main pillars of Christian thinking: (1) Scripture, (2) Tradition, (3) Reason, and (4) Experience. Scripture is the primary, overarching source of authority, and experience, reason, and tradition are subservient to it. And apparently that’s how you get to truth. Ta-da! The problem is that you just can’t do it this way. Why? Because these four elements are always inextricably intertwined with, and reliant upon each other. Think about this: Where did we get Scripture? It wasn’t just handed down to us from heaven. We (humans) wrote it. More specifically, people living within a particular theological tradition wrote it. We don’t get Christianity from the Bible; we got the Bible from Christianity. The early Christian church existed for a few decades before the earliest New Testament documents were written, it wasn’t really until Irenaeus in the second century that there was a definitive position on which Gospels were authoritative,1 and, while the 27 books of the present New Testament canon have been accepted by the occasional church leader throughout the last two millennia, it is difficult to point to the exact time that we came to a church-wide consensus on those 27 books since (in truth) there still is no church-wide consensus. And even if we could say that the vast majority of Christians across the globe accept the present New Testament as inspired and authoritative (which is true), it isn’t because the Bible itself names those 27 books. It is because Christian tradition has come to accept them. And don’t even get me started on the Old Testament, apocryphal, and extra-canonical texts! You simply cannot get to Scripture without going through tradition. In fact, you cannot get to Scripture or tradition without drawing on your experience of them. And there is no experience that has any meaning without us using some degree of reason to make sense of it. Hopefully by now you can see why “because the Bible says so” is a pretty shallow and poorly-thought-through notion. It just isn’t that simple. Why not just abandon the Bible then? After all, the thing is clearly a product of human effort. Why not just place it on par with the rest of the world’s greatest text—a good piece of literature, but not something to get too carried away about—and stop making such a big deal about it? Again, I’d like to go back to this concept of the Word of God. Although the Bible never calls itself the Word of God, it does refer to a couple things as the Word of God. Throughout the Old Testament, the Word of God is meant in general to refer to the truth and wisdom of God (1 Sam 9:27; 1 Chron 17:3; Ps 107:11). In the New Testament, we see the idea that this wisdom of God becomes incarnate in the person of Jesus of Nazareth (Jn 1:1–5, 14–18). If we want to be really biblical,2 then we must accept that it is Jesus, not the Bible, that is the Word of God. The Bible could then only be said to be the Word of God insofar as it reveals the Person of Christ to us. Well, hold on there, Sonny Jim! That’s circular reasoning. You can’t use the Bible to prove something about your perspective on the Bible. Right? That would be ridiculous. Thankfully, that’s not what I’m doing. Rather, what I am attempting to do is use the Bible to disprove something about the Bible, namely the notion that the Bible is the Word of God. It doesn’t say that. In fact it says something very different than that. What it says (in a manner of speaking) is that the foundation of our faith is not the biblical text, but the person Jesus of Nazareth. But don’t you need the Bible to know anything about Jesus? I don’t think so. Certainly, if we evaluate the biblical documents not as divinely inspired texts, but merely as historical documents, we can gain a decent understanding of who this Jesus of Nazareth was… at least what the early Christians believed about who he was. But even beyond that I think we’ve got some good historical reasons for believing in Jesus. You see, I think that even if we didn’t have the 27 books of the New Testament, we could piece enough together from other early Christian and non-Christian writings to conclude (with relative flexibility) that Jesus was most likely the sort of person who did and said the sort of things the New Testament claims he did. And if we are to examine the Gospels as historical documents (again, not as divine Scripture) according to the standards of historiography in their historical-cultural context, we find that they are generally very reliable. So much so, in fact, that we might reasonably conclude two things: (1) that Jesus of Nazareth believed in divine inspiration and guiding authority of certain texts in the Jewish religious tradition, namely the Old Testament; and (2) that Jesus did come back from the dead, thereby lending vindication to his and/or the early church’s assertions about his divinity. I hope you can see where I’m going with this. So yeah, in a nutshell. I believe in the Bible as divine Scripture because I believe in the historical Jesus of Nazareth. And not the other way around. Now, like I mentioned, I don’t think the Bible is the sort of magic book that Christians sometimes treat it as. But, insofar as the Bible presents us with an historical glimpse into the earliest and most widely agreed upon accounts of the Judeo-Christian tradition, and insofar as the Christian tradition (from whence we get the New Testament) is centered on the person of Jesus who I believe (on historical grounds) was most likely raised from the dead, then I am compelled to hold the Bible and especially the New Testament as an important source of authority with which to wrestle as I think through and formulate my faith and how I understand it. Other documents, both religious, scientific, and philosophical, are great, and I hope to get to them more on here. But they don’t hold the same place as the Bible for me…. because of everything I just wrote. But I’m sure you’re tired of reading, and I’m tired of writing. What do you think? 1: Irenaeus, Adversus haereses 3.11.8. 3: Cf. Clement of Rome, Ad Corinthios, xliv. 4: See the second century patristic Epistle to Diognetus, 7.3–4, 11:2-4. Posted in Scripture | Be the first to leave a comment!